FOR SALE BY PUBLIC AUCTION ON WEDNESDAY 8TH AUGUST, 3PM, MARRIOTT HOTEL, SWANSEA MARINA. 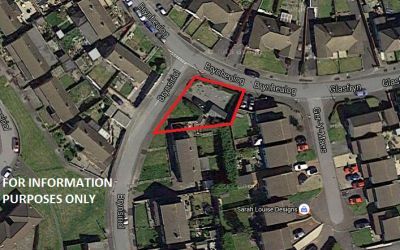 We are delighted to take to auction this plot of land in a popular residential area in Llanelli, with good access to the town centre and local amenities. The plot has planning for a detached dwelling. OUTLINE PLANNING APPLICATION NUMBER WITH CAMARTHEN COUNTY COUNCIL S/31078. From our Llanelli office, head towards Asda, continue along past the bus station and at the roundabout take the third exit off sign posted Swansea, at the next roundabout take the second exit onto Frondeg Terrace, at the mini roundabout, turn left onto Capel Road and at the top of the hill turn left into Glasfryn, take the first left into Brynsiriol and the land is on the left hand side. NB: All successful purchasers will be subject to a buyer’s premium of £300 plus VAT.